Welcome to the website of Santa María de Sobrado Monastery – a Cistercian monks community (OCSO). 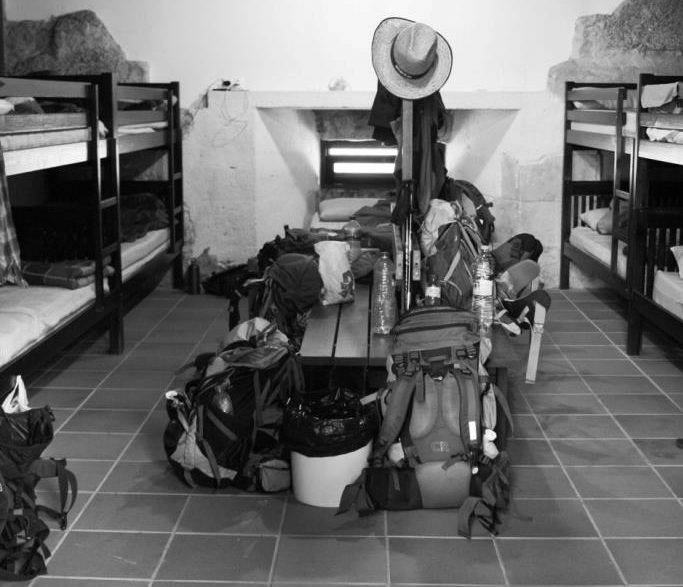 Here you can find informations concerning the Pilgrim’s Hostel, a brief description of the daily schedule and contacts of our monastic community. Welcoming pilgrims of Santiago Route has been part of Sobrado Monastery history, part of the identity. Indeed, the entrance cloister of the Monastery is named “Pilgrims Cloister”. All the ground floor is available for welcoming pilgrims. 20 spare matresses that can also be used. Showers with warm water. Small kitchen equipped with dishes, glasses, saucepans. Room for having meals. Washing and dryer machine. Outdoor area for drying your clothes. During your stay, you have the possibility to visit the Monastery touristic area that comprises the ground floor cloisters public access and to attain all monastic liturgic events that you would like, celebrated in the monks chapel. 1. Once you have registered in the porter’s lodge, the person in charge of the hostel will give you a bed in one of the dormitories in the Pilgrim’s Cloister, and will also point out the showers/toilets and explain how to use the washing and drying machines. 2. The person in charge of the hostel will also indicate the outdoor area for drying your clothes, which is reached through a side door in the dinning room (west-side). This area is also available for taking sun and rest in general. 3. We strongly recommend that you avoid the gravelled space around the perimeter of the Pilgrim’s Cloister because of the danger of falling roof tiles. 4. At all times, but above all in the cloister and at the outdoor area for drying your clothes, we warmly insist that you dress appropriately (bikinis prohibited), bear in mind the fact that you are in a religious building. 5. Be aware that if you go for a walk or take dinner in the village, that the hostel closes at 22:00 sharp and the lights are turned off. You have to arrive before this hour. 6. From 22:00 onwards, please take in consideration that you must be silent not only in the interior of hostel but also in the cloister area. You can also stay in the kitchen to finish your dinner, read, but avoid making any sort of noise and always keep the doors closed. Bear in mind, that there could be people already resting not only in the hostel area, but also in the first floor where the guest house rooms are located. Please do all you can to maintain this silence early the following morning when you get up and leave the hostel. 7. We kindly ask you in helping us to keep the hostel cleaned: take your belongings from the floor, clean everything that you use in the kitchen and in the bathrooms; before you leave the monastery place the blanket as you found on the top of your bed. 8. The front door will be closed until 6:00 in the morning. At his hour the door will be open for those who would like to leave early. 9. Regarding any queries or problems, please consult with the person in charge of the hostel. It is our sincere hope and desire that your stay in our hostel be a pleasant one. With our very best wishes and may your walk go well!